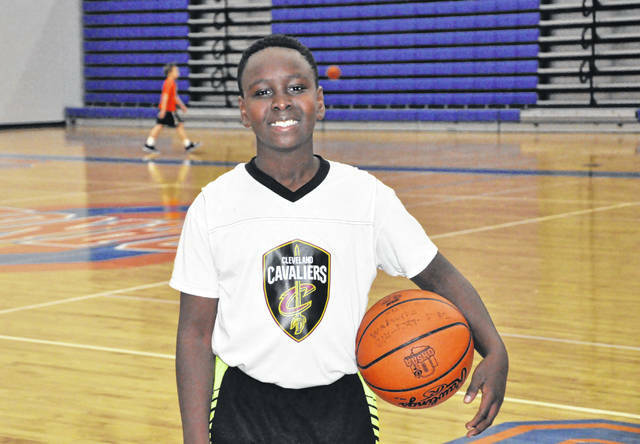 Guma Wabwire, a fourth-grade student at Oak Creek Elementary School, was selected in September as one of five junior reporters for the 2018-19 Cleveland Cavaliers season. While Wabwire’s experiences have shown him the ropes in the sports media industry, he says they have also helped him to develop as a basketball player. When Alisa Wabwire saw an email from the Cleveland Cavaliers about their junior reporter contest and approached her son about entering, she didn’t necessarily expect to hear back from them. But 9-year-old Guma Wabwire’s excitement about the contest encouraged the Lewis Center family to at least give it a shot. 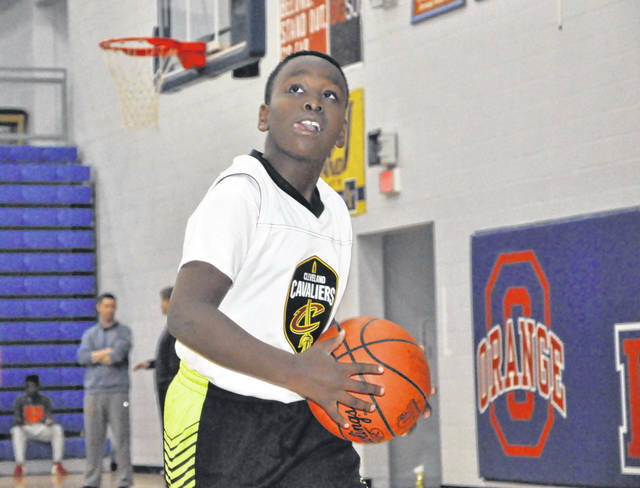 With the help of his father, Patrick, who is skilled in video editing, Cleveland-born Guma put together the required 60-second video explaining why he should be selected to be a Cavs junior reporter for the 2018-19 basketball season. He was sure to go above and beyond simply professing his love for the Cavs, however, rattling off player statistics, something his mother said he takes great interest in. The video was submitted on the final day of the contest, and within 24 hours, Guma was notified that he had made the first cut, narrowing the pool to 10 kids. But there would still be one more cut to make before he was selected to the program. Next, the fourth-grader at Oak Creek Elementary School was asked to interview Cavaliers in-arena host and emcee Ahmaad Crump. Once more, a day later, Alisa received an email from the Cavs, this time to congratulate Guma on being selected as one of five junior reporters for the upcoming season, and the only one not residing in northeast Ohio. Despite his only prior interview experience coming when he once interviewed his school nurse, Guma said there were no nerves and he was completely comfortable as he interviewed Crump. Asked if he ever expected to win the contest, Guma said he was “hopeful” and was “very happy” to find out he had been selected. First up for the Cavs junior reporter was the team’s media day on Sept. 24 at the practice facility in Independence. There, Guma interviewed then head coach Tyronn Lue and players such as J.R. Smith and the Cavs’ newest baller — and Guma’s favorite player — rookie Collin Sexton. Other events Guma has covered so far include a Cavs youth camp in Columbus and the Dec. 8 game against the Washington Wizards — a game the Cavs would win —where he attended and participated in current head coach Larry Drew’s postgame press conference among Cavs media personalities such as Cavs legend and current Fox Sports Ohio color commentator Austin Carr. Alisa said Guma’s next assignment has not been announced yet, but there will be more events to come this season. Among the things Guma said he has learned about sports reporting is that the reporter has to be selective. “You have to choose only a few questions, you can’t ask everything,” he said. He added his favorites in the basketball media industry are the former players on TNT’s Inside the NBA pre- and postgame show —Shaquille O’Neal, Charles Barkley and Kenny Smith — who had great playing careers and then transitioned to the media. Guma hopes to follow a path similar to those analysts he looks up to. He currently plays basketball in the Olentangy Youth Athletic Association. At 5-feet-2-inches tall, he is the tallest player on the team. His father stands at 6-feet-9-inches tall, meaning Guma shouldn’t stop growing anytime soon. Being a junior reporter has given Guma, whose name his mother said means “strength and resilience,” a taste of what the sports journalism industry is like. But it has also helped him grow the mental aspect of his own game. Specifically, he said he has learned how many different pieces must go into one particular play in order for it to be successful. Guma’s love for the game is very apparent, which could serve him well in a variety of capacities involving the sport down the road. Alisa said she has seen her son blossom in the time since he began the program, exuding more confidence in public settings, whether that be in church performances or on the court. Perhaps this experience with a professional sports franchise may be the beginning of a career in the business; Guma said he hopes to contribute to the school’s newsletter next year when he is eligible as a fifth-grader. But while he said he is certainly interested in reporting someday, Guma was quick to clarify that thought. “After I’m done playing basketball, of course,” he said with a smile.